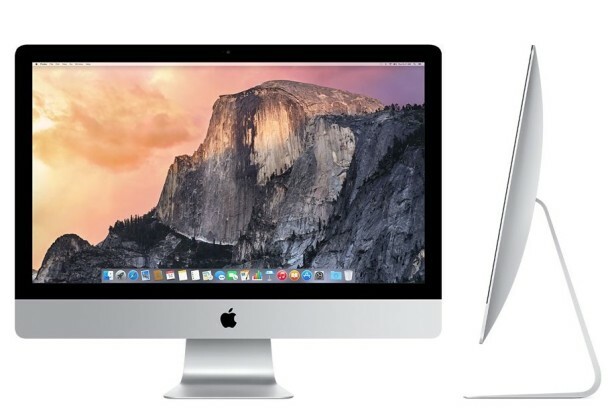 Apple has released updated versions of the Retina iMac 27″ and Retina MacBook Pro 15″. Both models received fairly minor updates to specifications, but offer some notable improvements which make them worthwhile for users considering new Mac hardware. Separately, Apple also released a Lightning Dock charger for iPhone. 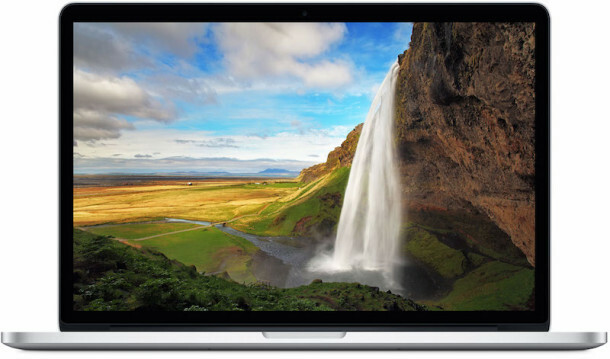 The revised 15″ MacBook Pro receives a Force Touch trackpad, which was first introduced earlier in the year on the 13″ Retina MacBook Pro model and 12″ MacBook Retina model Macs. Additionally, the new 15″ Retina MacBook Pro has a much faster SSD drive which is said to be 2x faster than the solid state drive it replaced. A small bump to battery life also comes along for the ride. 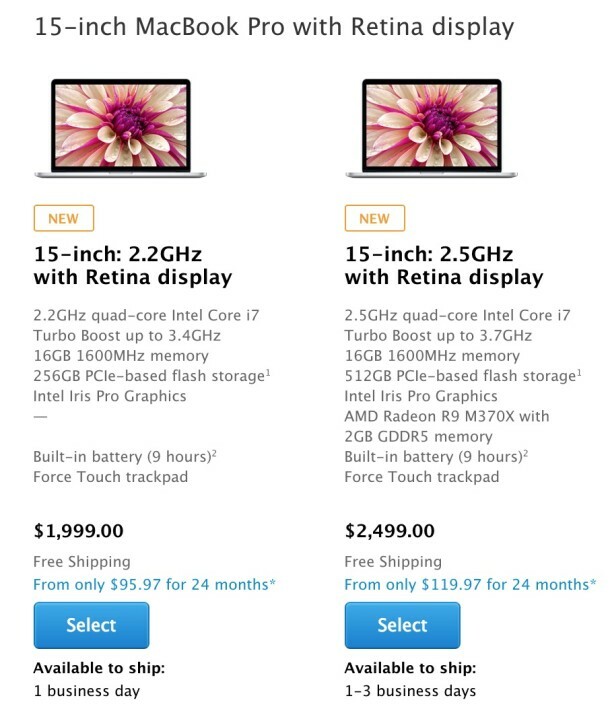 As before, the 15″ Retina MacBook Pro starts at $1999 for the base model with an Iris Pro GPU, and $2499 for the upper-end model with a dedicated discrete GPU. The updated 27″ Retina iMac with 5k display arrives with a price cut, starting at $1999 for the base configuration, and $2299 for the upper-end model. Both updated Macs are available to ship in a variety of configurations from 1 to 3 business days. Aside from Mac hardware, Apple also released a Lightning dock charger for iPhone models, which costs $39. There was some speculation that more significant Mac hardware upgrades would arrive at WWDC 2015, which begins on June 8, but the release of these spec-bumped 27″ 5K iMac and 15″ Retina MacBook Pro models suggests otherwise, at least for those particular product lines. Nonetheless, WWDC is expected to unveil the next version of OS X 10.11, iOS 9, and an Apple TV update. Interesting but kind of ho-hum, makes you wonder why these weren’t released when the 13″ rMBP got the same update to Force Touch. For me, I’ll wait for an Intel Skylake CPU version of the 15″ MacBook Pro Retina, then upgrade to that, it should be a screamer. The 27″ 5k iMac appeals to me loosely for the screen size, but I like to be mobile, so I’ll stick with the rMBP line. The current hardware enclosures look really nice but a little long in the tooth for Apple, I suspect maybe next year we will see a redesigned enclosure that makes them a bit thinner and lighter. With that, I just hope that Apple doesn’t nerf the rMBP with a major hardware redesign, it would be tragic if they were to remove what makes it a “Pro” machine – dedicated GPU, USB ports, HDMI, Thunderbolt, etc. Sure, ditch that stuff on the MacBook Air and MacBook line, but the ports have gotta stay there for the Pro, this is indeed what all professionals use! Our entire office is on Retina MacBook Pros, and I know of many other companies that are the same way, all mobile, all powerhouses, come into the office and dock it to big external displays, keyboards, wacoms, etc, and take them on-the-go when need be. I’ll put my money on WWDC 2016 for redesigned MacBook Pro Retina enclosures, bet they will look a lot more like the current MacBook Air, too. the biggest “fail” of the day – 15″ rMBP with the old CPU – this could have solved lots of the current people’s issues – hot/noisy laptop on a higher load. It’s weird that 13″ got 5th gen, whilst 15″ only the “ancient” 4th gen :-/ .. what a shame and disillusion .. I spotted this. Very strange. Intel still hasn’t released quad core 5th gen CPU, but they have released dual core. That’s the reason we still haven’t seen broadwell on rMBP 15. And apple is probably gonna skip it completely and go for the skylake instead. On a side note. Does anyone know where I could get a copy of the wallpaper featured in that top MacBook? Makes a great wallpaper, using it right now. An array of blending solid color tiffs changing every minute …, rules. Thanks! I wish Apple would release the wallpapers they feature on their website in OS X.
Screw the updates, I want to know more about the Lightning Dock!!! Is there a link? Couldn’t find it in the Apple Store. Safari seems a little snappier. Ordered a 27″ iMac last week and this morning got an email from Apple saying, “As you may know, Apple recently announced the new iMac 27″. Since your order has not dispatched, we have automatically upgraded you to the new iMac 27”. They do not say what the upgrade is, just provided a link to Apple site. My order was for a 27″ with 3.4GHz CPU and with the graphics option of NVIDIA GeForce GTX 780M 4GB GDDR5. Doing my own research on Apple site it seems that the “upgrade” is in fact a downgrade to (1) 3.2GHz CPU and (2) NVIDIA GeForce GT 755M 1GB GDDR5. I also note the i7 CPU option is no longer available. I have cancelled my order as I wanted that spec for video editing. 1GB graphics doesn’t cut it. My order had a 2-3 week wait but I see that it is now 1 Business day. It looks like I may have been premature in my complaint. I should have looked at my order on the Apple site, not current models. I do appear to be getting an “upgraded” spec. 3.5GHz CPU, Retina 5K display, 8GB RAM, 1TB Fusion Dr (instead of 1TB Serial ATA) and AMD Radeon R9 M295X 4GB GDDR5. did you order iMac 27 or retina? (…I didn’t see this post when I replied to your last comment, I assumed you were referring to non-retina.) …it looks like they did indeed boost the specs above the base model, you can get the retina as high as 4.0GHz i7 w/4.4GHz boost. I ordered iMac 27 non-retina. I dont understand why Apple Replaced the Nvidia Gpu in the Top rMBP model, I have heard Nvidias are way better than AMd in GPU performance even if they are of older hardware. Can the new 5k be used as an external monitor? Thanks for any info. Leo’s review sucked on MBW.